One of the oldest of its kind in North America, the School of Veterinary Medicine of the University of Pennsylvania is the only veterinary school in the United States that was a direct outgrowth of the University’s School of Medicine. In 1807, Benjamin Rush, one of the three original professors of the medical school, proposed that instruction in veterinary medicine be given at the University of Pennsylvania. It was not until 1882, however, that Joshua Ballinger Lippincott, one of the University Trustees, donated $10,000 for the purpose of establishing a veterinary school within the University. The Board of Trustees appointed a special committee with Lippincott as Chairman to consider plans for inaugurating such a school. In October 1884 the School of Veterinary Medicine was opened with Dr. Rush Shippen Huidekoper serving as Dean. Funds for the construction and equipment of the first buildings were contributed by Mr. Joshua Ballinger Lippincott, Mr. J. E. Gillingham, and Mr. Fairman Rogers. Beginning a century-long tradition of support, the state of Pennsylvania appropriated $25,000 for the School in 1889. This was only the first step of many that have contributed to the rapid growth of the School. In order to make way for the present medical laboratories, the School of Veterinary Medicine moved from 36th and Pine Street to 39th and Woodland Avenue in 1901. In 1905, Dean Leonard Pearson presented plans for a combination of new veterinary school and hospital. Generous contributions, a gift of $100,000 from Mrs. James J. Goodwin (daughter of Joshua Ballinger Lippincott), a bequest of $50,000 from Mr. Joseph E. Gillingham, and more state appropriations totaling $380,000 from 1906 to 1911, allowed for the completion of a new building by 1913. The school has since resided in this building. The Faculty voted to admit women to the course in veterinary medicine in 1933 provided “that no concessions be made in regard to the work required.” Within two years, the school was offering courses for advanced work in veterinary pathology leading to master and doctoral degrees. The school has been offering graduate courses in cooperation with the Graduate School of Medicine ever since. 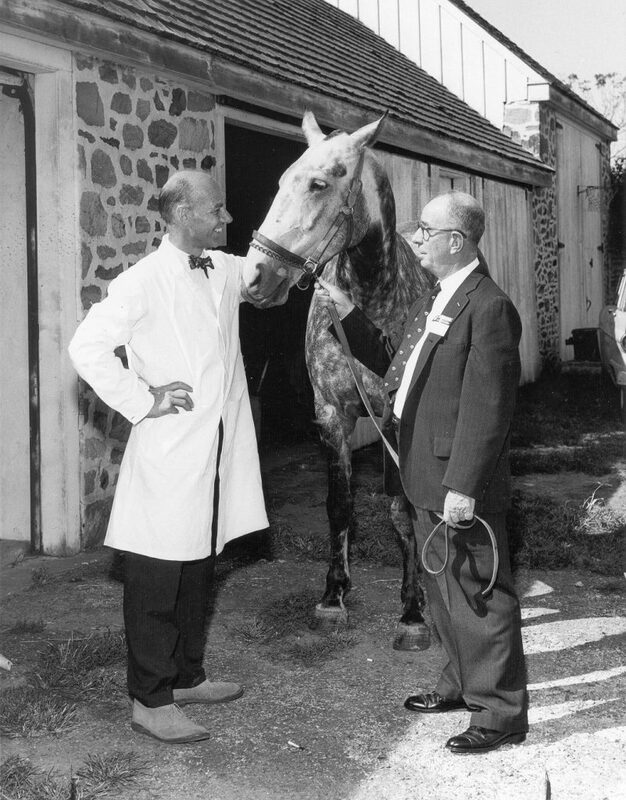 A gift by the heirs of Effingham B. Morris of Bolton Farm in 1937 led to the establishment of an ambulatory clinic to aid the clinical instruction in veterinary medicine. In 1945, the faculty reorganized the ambulatory clinic and established the Media Field Station, which served as the School’s clinical center until 1952. In 1947, a third floor was added to the north wing of the school building to provide quarters for pathology and microbiology. The University acquired a tract of land at London Grove, Pennsylvania, 32 miles southwest of the University campus, for use by the Veterinary School in 1952. Named New Bolton Center, it has been a major base for teaching, research and clinical services in veterinary medicine. In recent decades, the School of Veterinary Medicine, in cooperation with the faculty of the School of Medicine, further specialized the discipline and thus strengthened its status as one of the nation’s leading veterinary schools. Printed — Flyers, programs, etc.